Last December, 2 days before Christmas Day, I drove all the way to Johor Bahru for a short holiday. 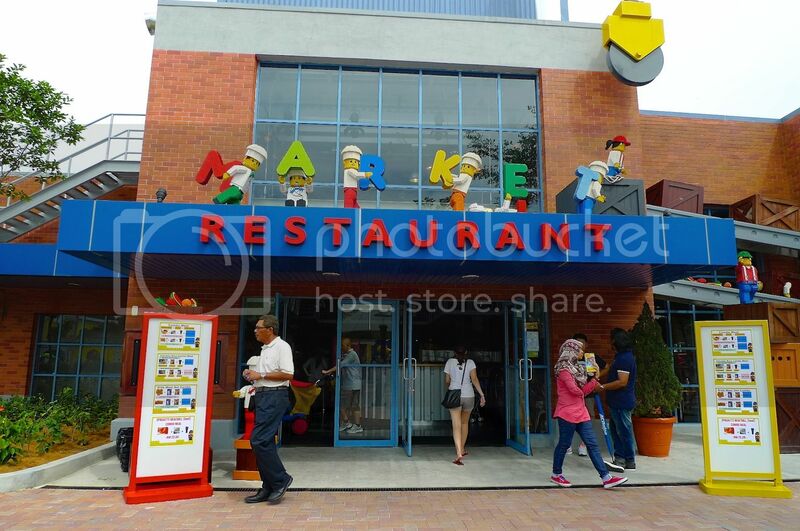 My main intention was to meet up with my good friend Jim Long, who stays there and to visit Legoland Malaysia. 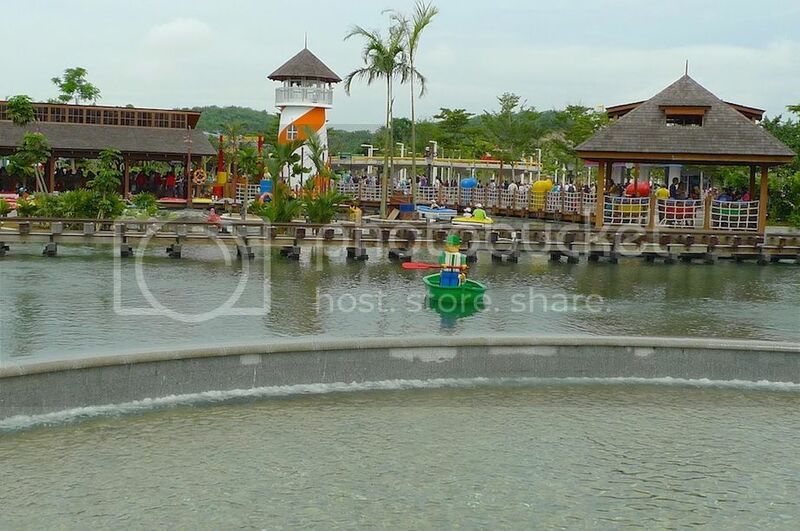 Of course, I ended up visiting the famous Johor Premium Outlet (JPO) and crossing over to Singapore on Christmas Day to enjoy the amazing Gardens by the Bay and Orchard Road. I shall blog about all that in my upcoming posts. 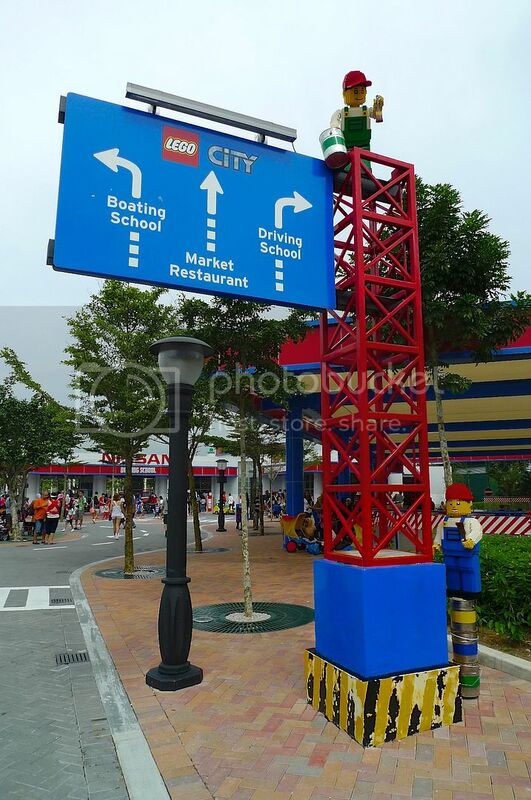 I took the above photo of the Legoland entrance when we were about to leave later in the afternoon. When we arrived there at around 10am (which is the opening time), there was already a huge crowd and I was more interested to queue up than to take photos! Luckily, the queue moved quite fast. But I was surprised to find that they had run out of maps! I needed a map to navigate my way around. 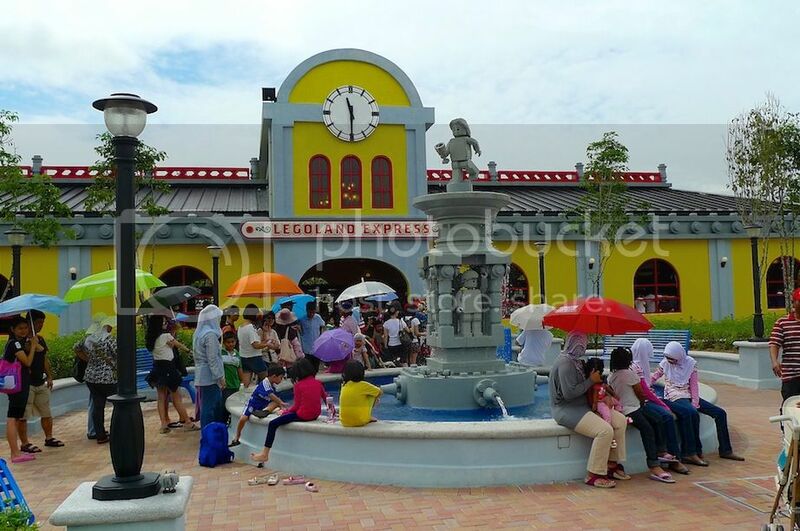 Legoland is something like a mini Disneyland and I wanted to know where I was at any point of time in there. After enquiring at the Guest Service Counter, we were told to wait for them to replenish the maps. Fortunately we did not have to wait long or else I would start complaining! 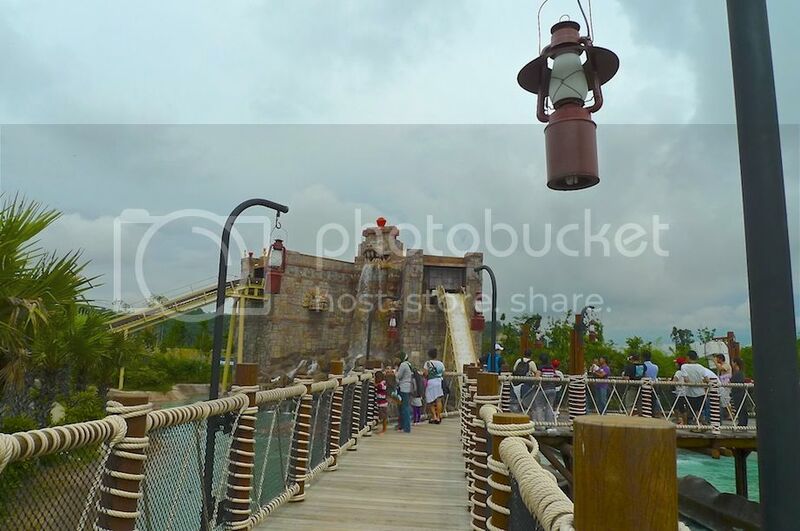 They should really have the maps and brochures all ready before they allow guests into the park. 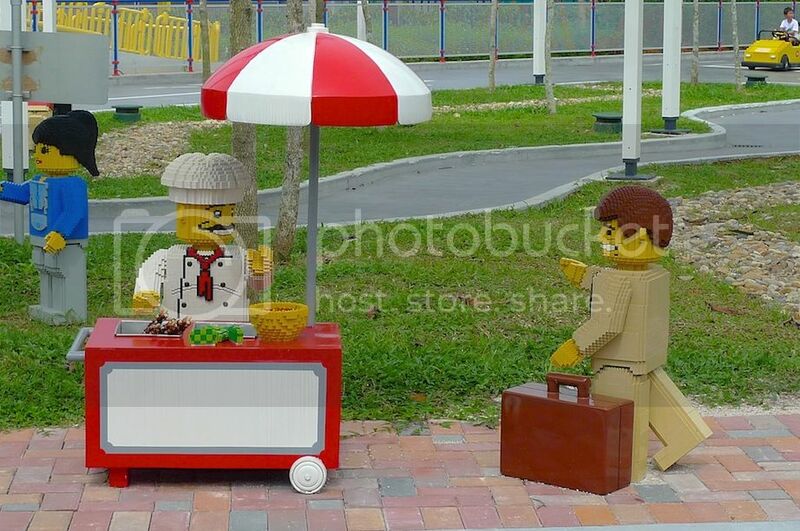 I wonder if this only happens at Legoland Malaysia or also at other Legoland parks worldwide? 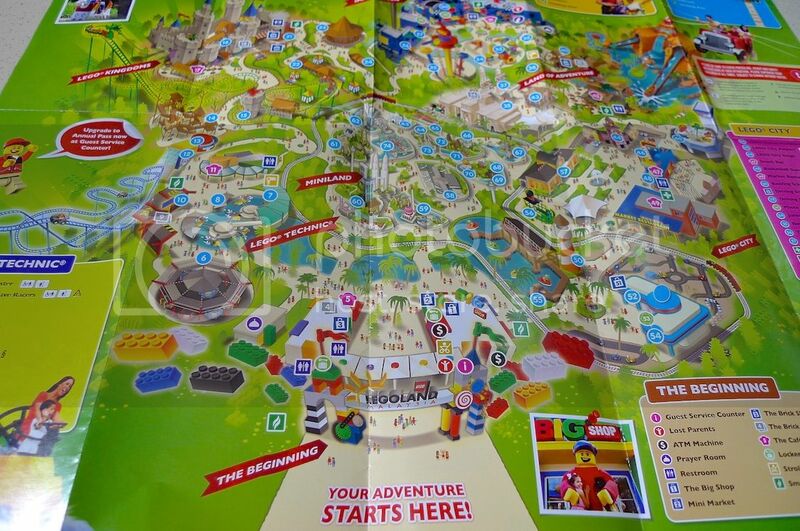 Anyway, that's the map of Legoland Malaysia. If you like to look at the interactive map online, click HERE. 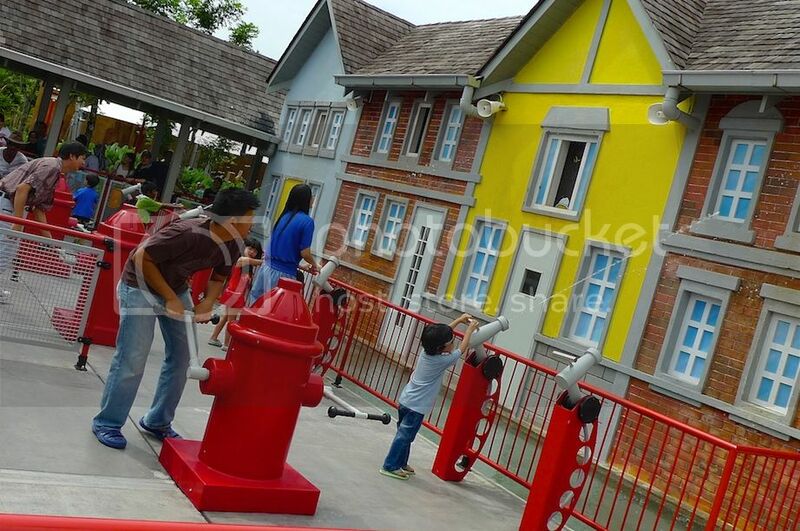 Legoland Malaysia has 7 themed areas of attractions - The Beginning, Lego City, Land Of Adventure, Imagination, Lego Kingdoms, Lego Technic and Miniland. The Beginning is the area right after you come in through the entrance. 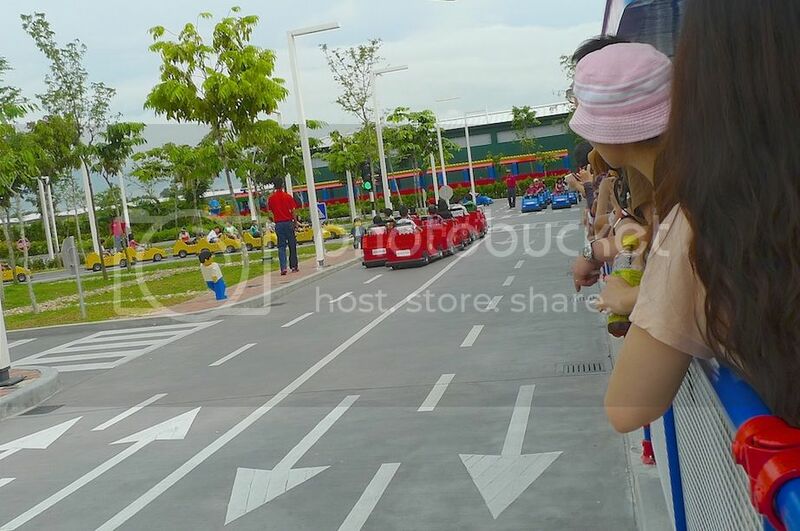 Here you can find Guest Service Counter, ATM machines, prayer room, restroom, mini market, cafe, locker and stroller rental counters. It's the Miniland where they have all the miniature version of famous landmarks and buildings around Asia that I was most interested in! And of course, Jim and I headed to the Miniland first! 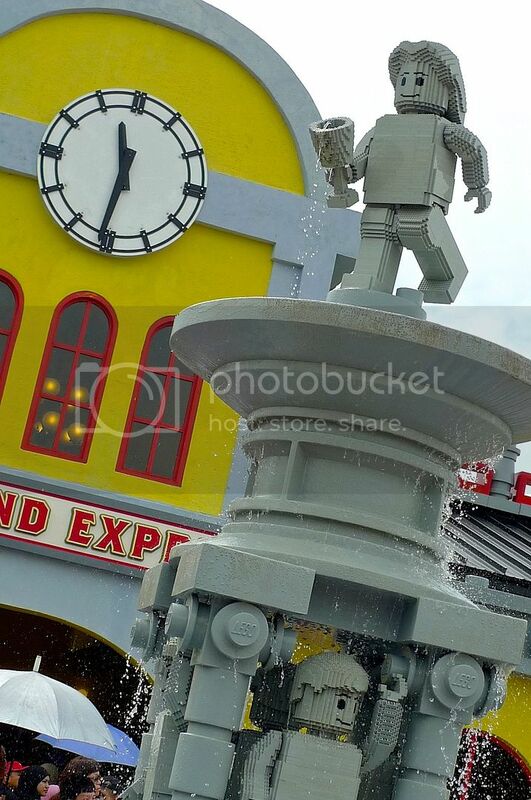 However, I shall not be blogging about Miniland in this post - there are just too many photos to edit! LOL! 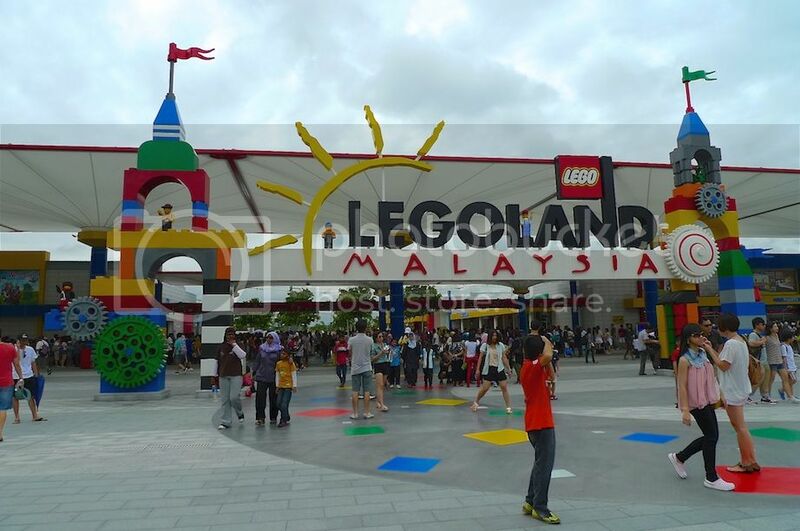 For now, let me bring you on a tour around Legoland starting from Lego City. 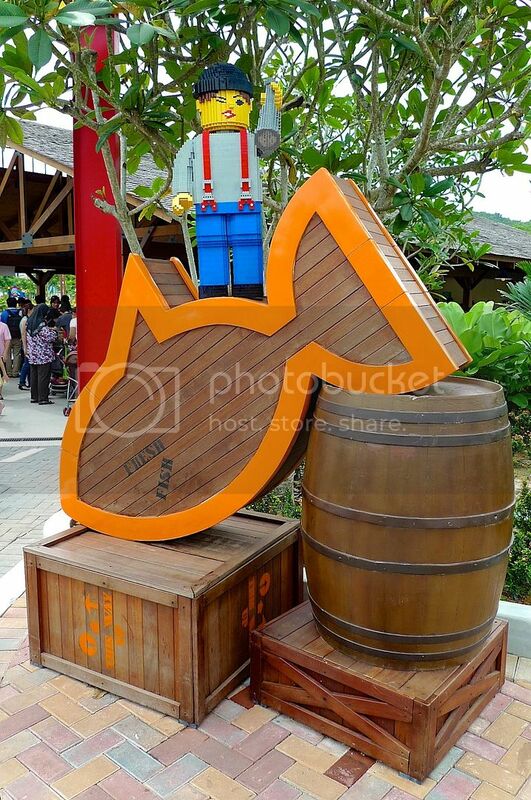 That's a cute directional signboard, don't you think? 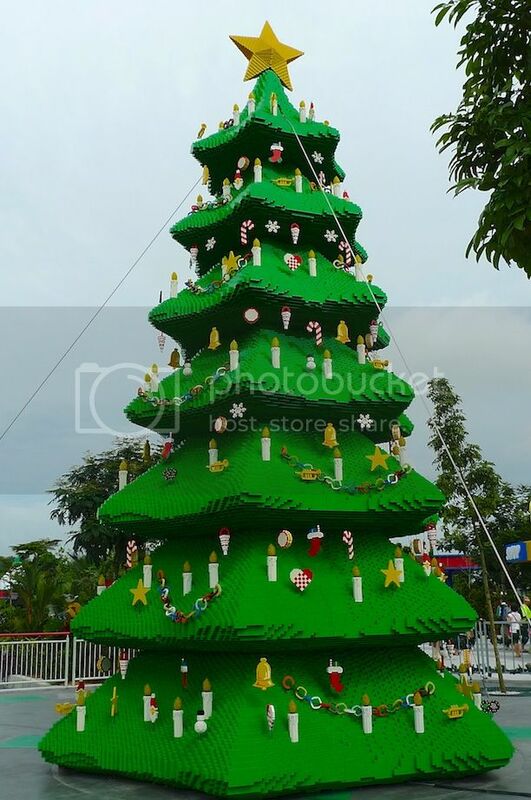 Do expect lots of stuffs made from Lego bricks! 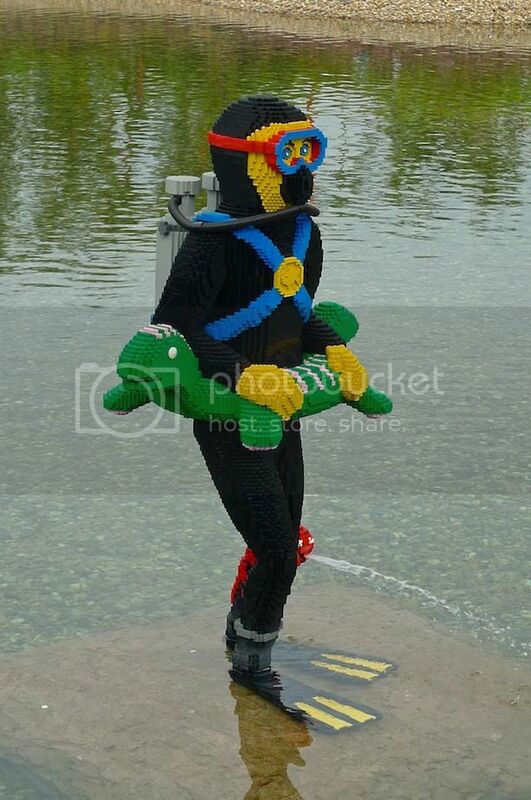 This is Legoland after all! First, I headed to Driving School. Look! 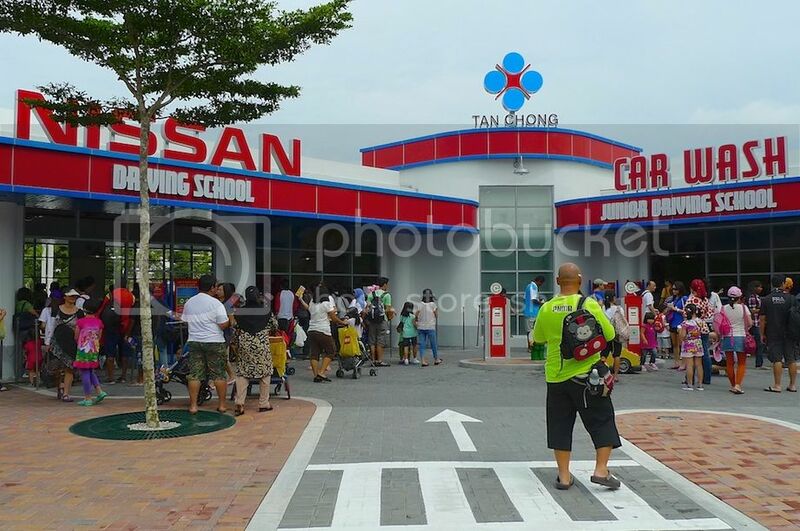 They have a Driving School on the left and a Junior Driving School on the right. 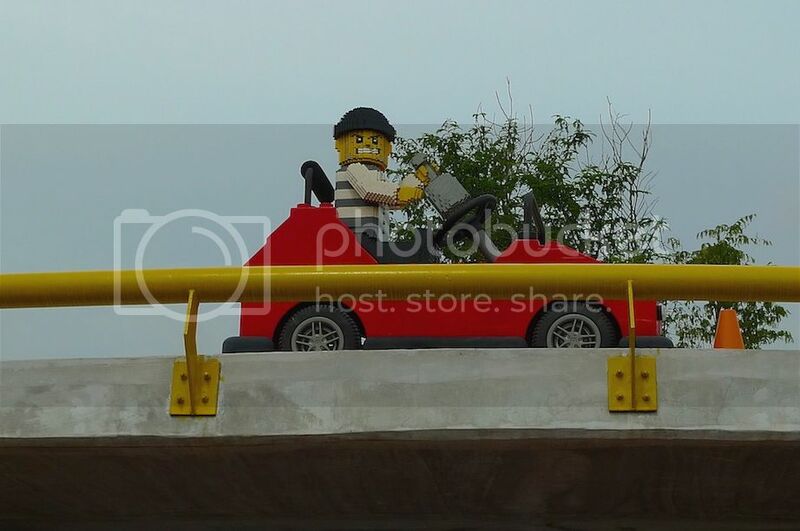 I find the expression on this driver rather mischievous! LOL! 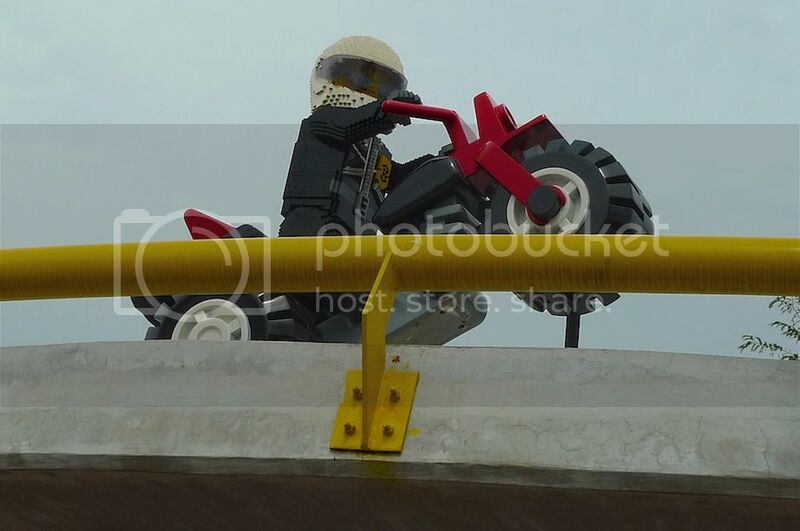 A Lego biker zooming on the flyover above me. 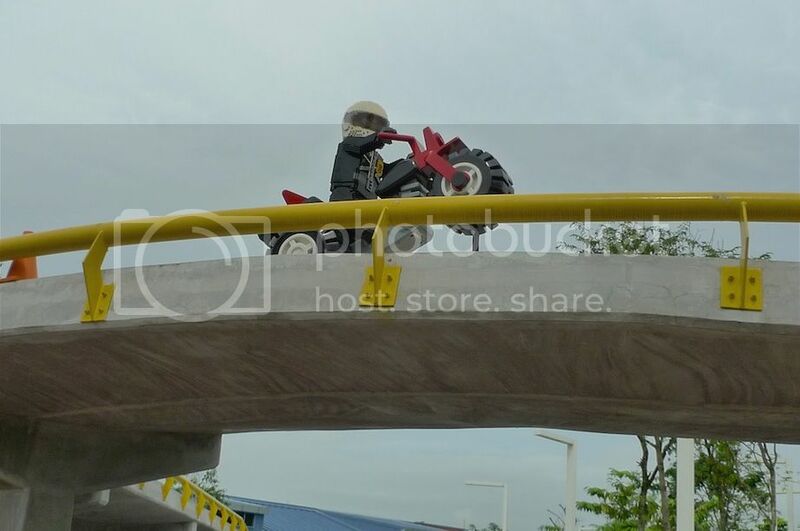 Both he and his bike are motionless of course. Haha! 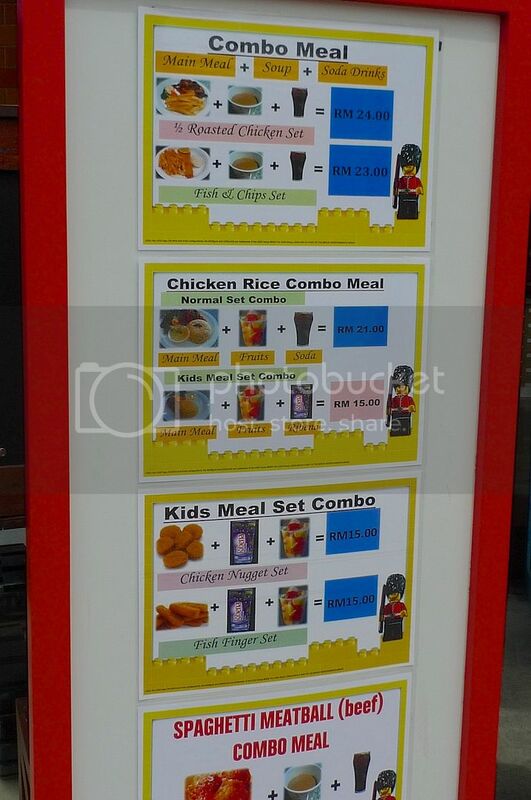 Cute road side stall at the Driving School. Lots of children driving on the roads inside the Driving School, with their parents watching from the stands. Yeah children. I did not see any adults driving. Next, I went over to the Boating School. By now, Jim and I were on our separate ways. We were busy taking photos and watching all the activities that we did not even know we were not together anymore. 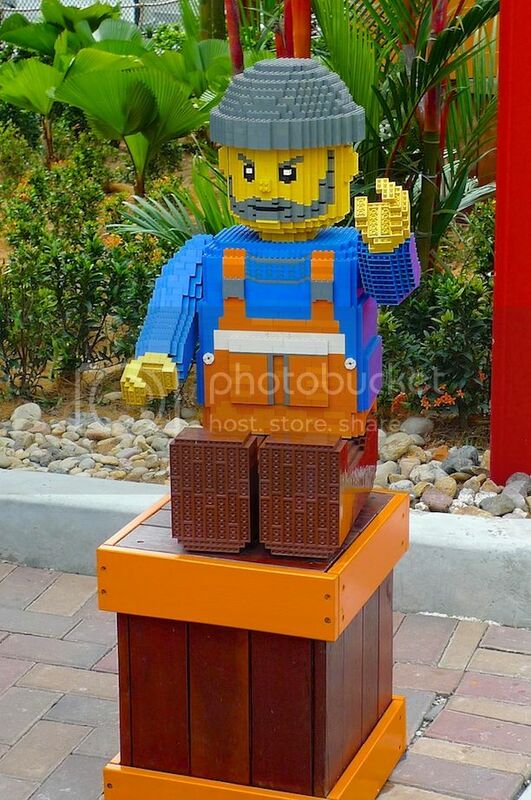 Cute Lego man on top of a big fish, barrel and boxes. 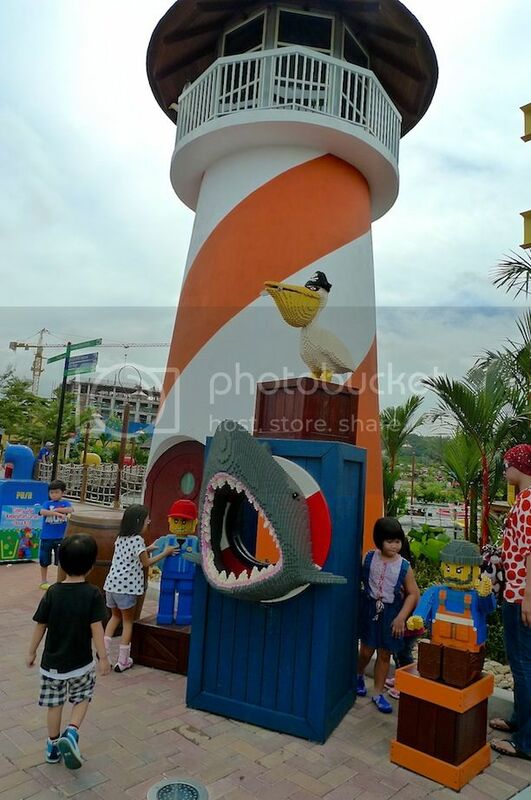 Nice lighthouse, shark and pelican. 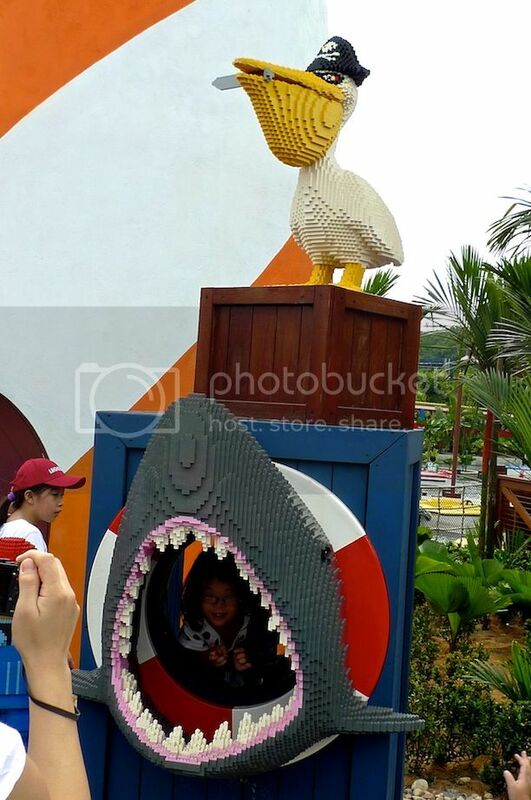 I can tell you that it's all these cute Lego toys and structures that make Legoland such a joy to visit! Children seem to love them too! And everyone wants to take pictures of them! 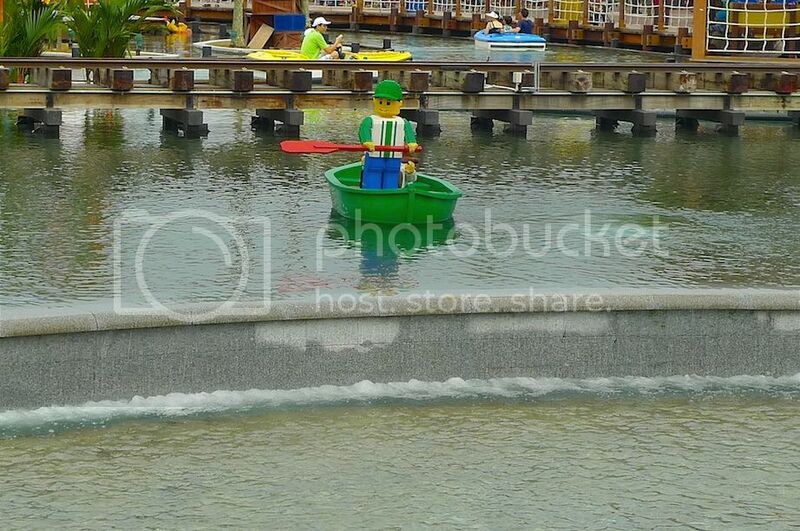 I saw a Lego man paddling a Lego boat in the lake right behind the Boating School. Did I go boating? Of course not! 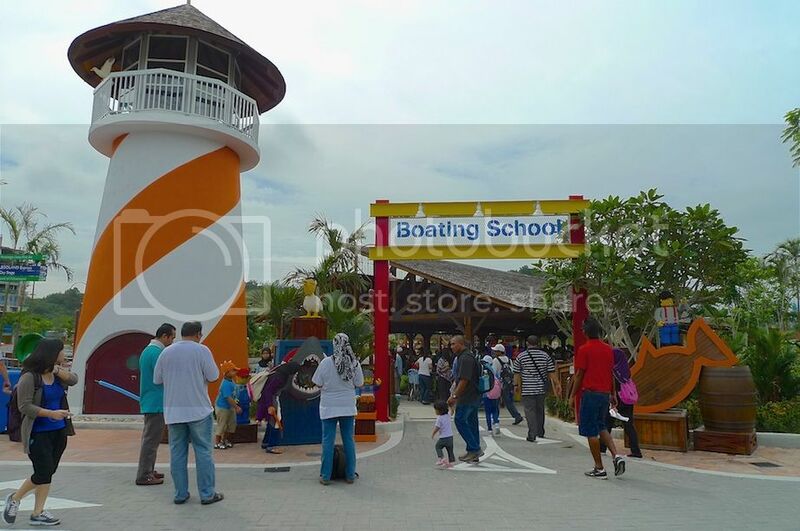 I am not going to queue up just to sit on those boats meant mainly for children! Haha! 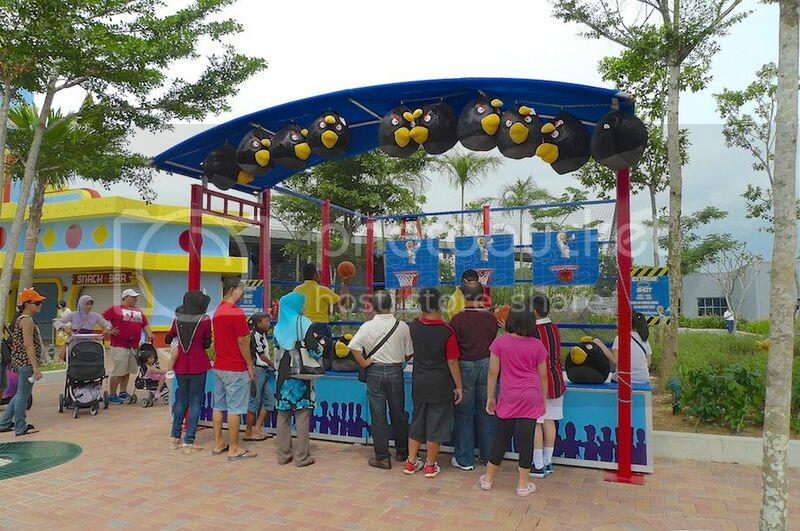 Yes, you need to queue for all the rides and activities. It's just like Disneyland. Yawn. Can't remember where I took this picture below but I think it's somewhere near the Boating School. What do you think he's pulling? Nearby is the Market Restaurant in case you are hungry after all those driving and boating! 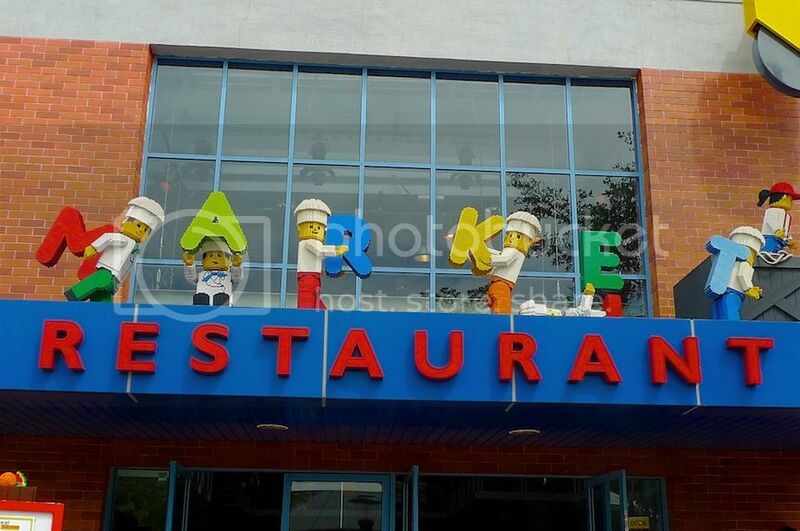 Cute Lego chefs on top of the restaurant facade. 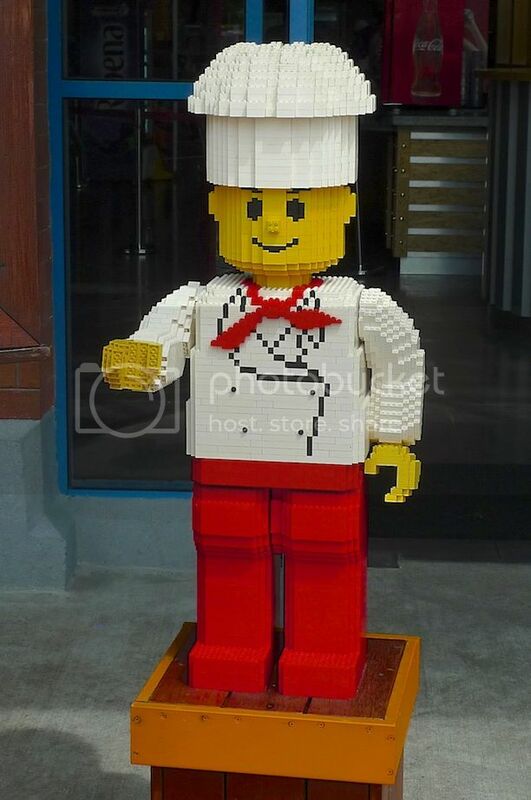 A Lego chef welcoming me in. I was not hungry so I did not go in. But a check on the menu and pricing was enough to stop me from entering the restaurant! LOL! 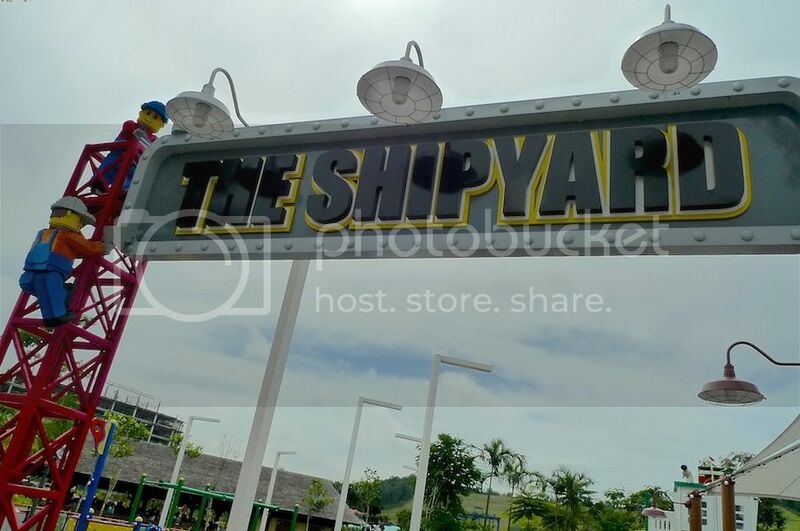 Near the Market Restaurant is The Shipyard. 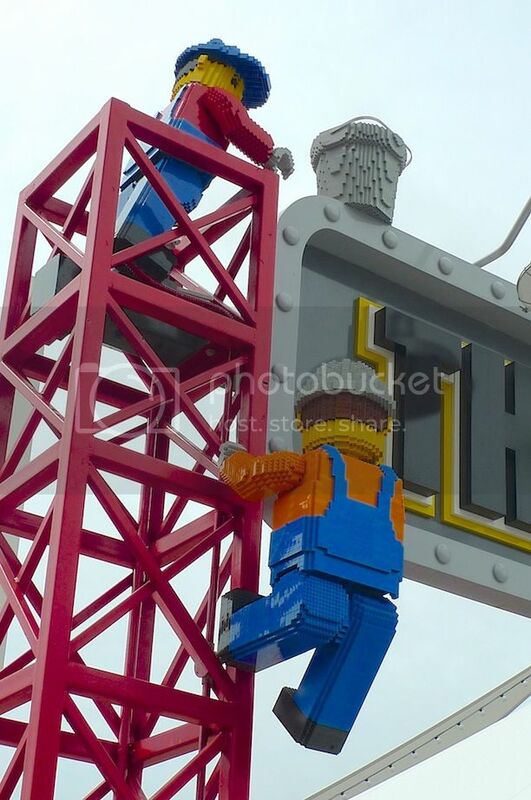 Lego workers fixing or cleaning the signboard. I did not enter as I could see from outside it's mainly a place for kids to play. Moved on and saw a stall with Angry Birds! Actually, it's a Basketball Game where you can win the huge black Angry Bird plush toy. 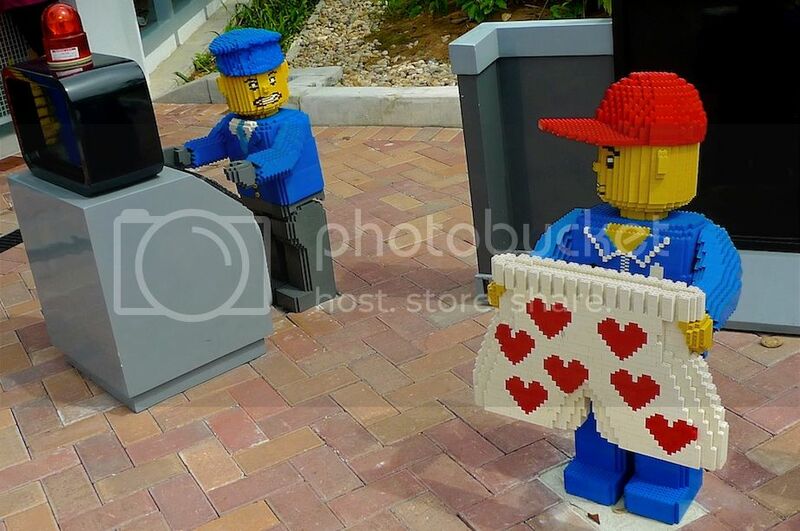 There is a train service that goes round the Legoland park. 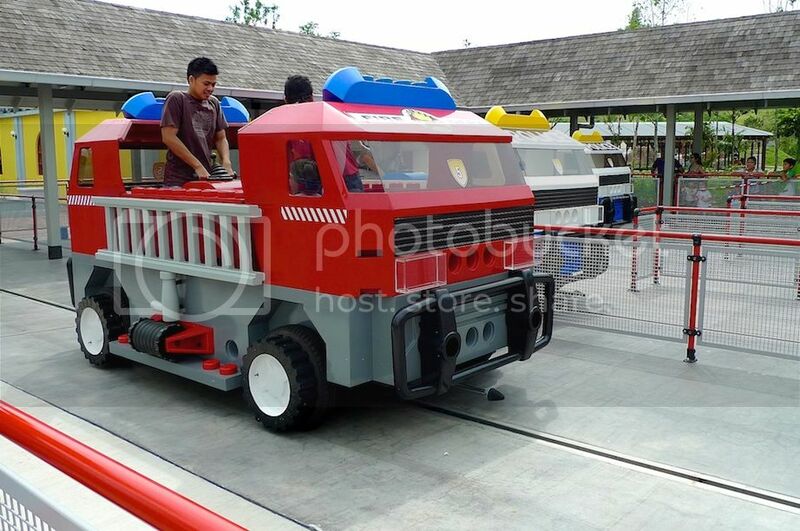 You can board the train at Legoland Express. No, I did not bother to queue up for the train ride. 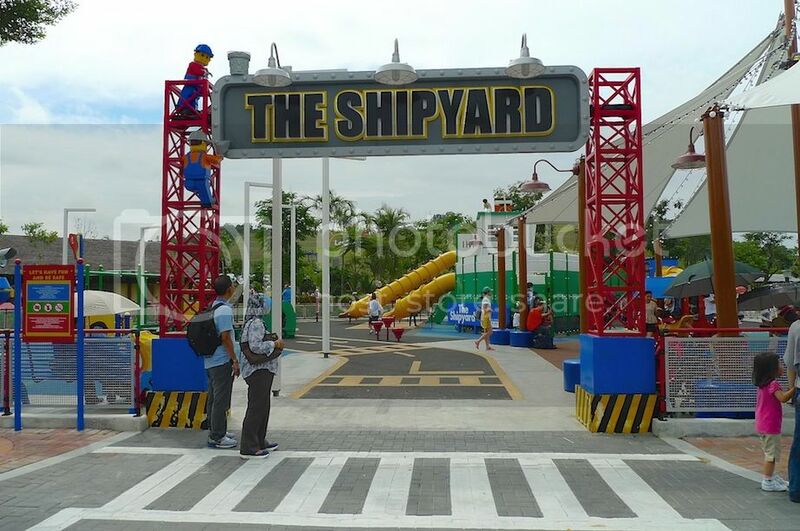 As you can see by now, it's all about queuing, queuing and more queuing at Legoland. 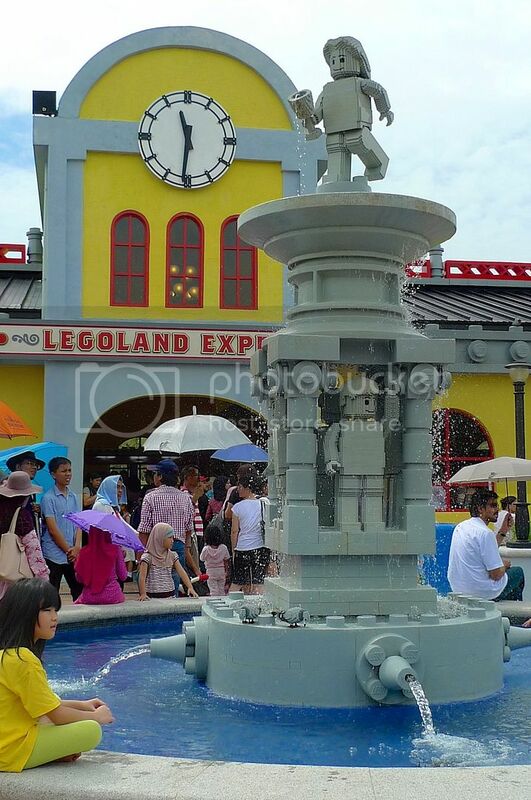 Nice fountain in front of Legoland Express station. 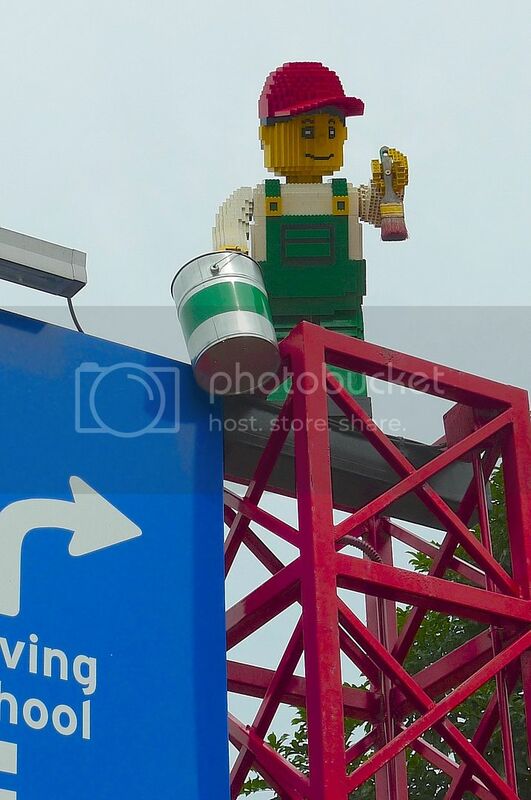 I guess my enjoyment of Legoland was mainly on the cute Lego structures and figures. 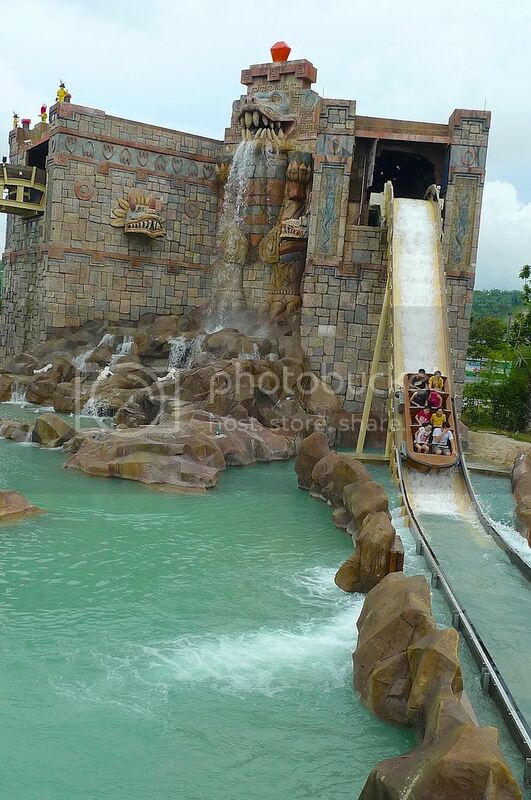 It's not about the rides and activities, which I felt were more suited for children. 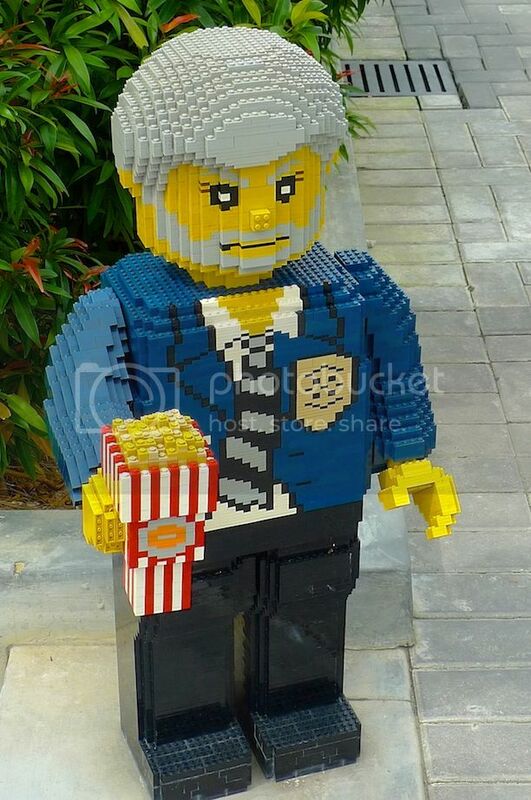 A Lego man outside the train station offering popcorns. Next to the station is the Lego Rescue Academy. It's a place for kids (with the help of adults) to be firemen for a day and help put out fires by shooting water at a building. Now if only they have real fire! LOL! 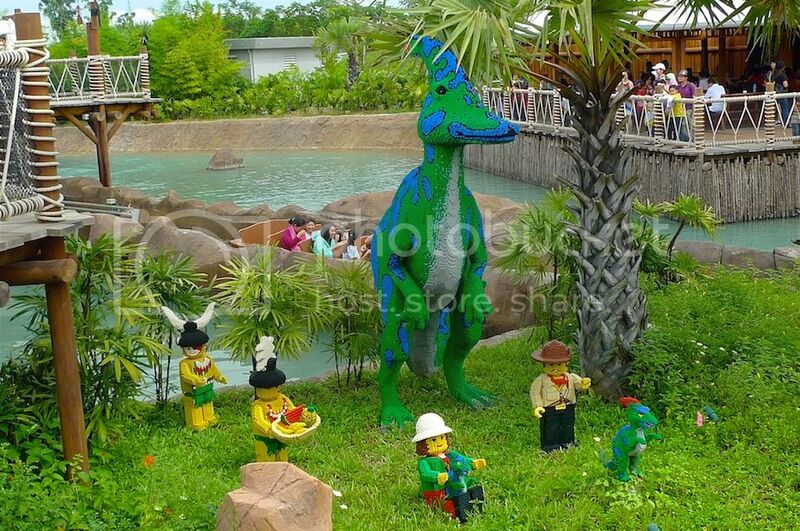 Bored with Legoland? 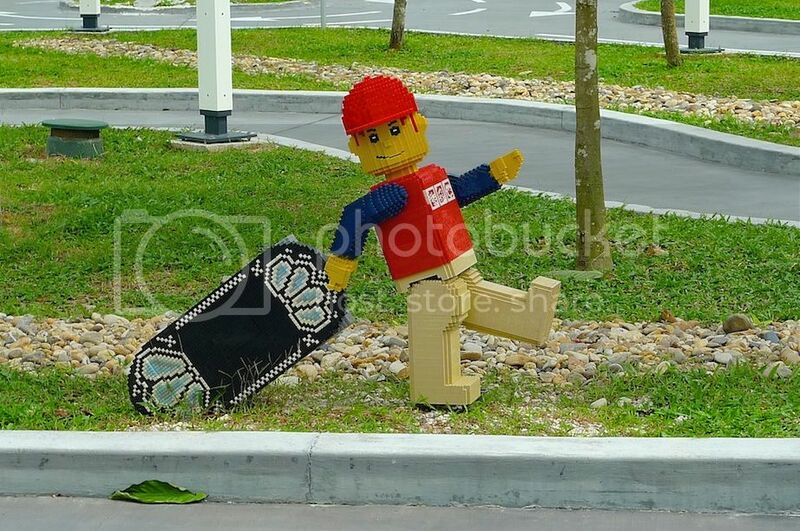 Fly off from the Lego City Airport! Haha! 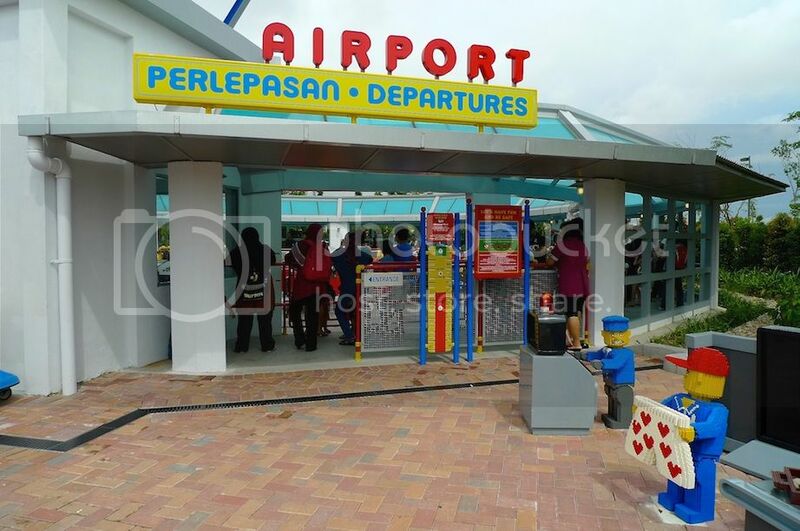 Of course, it's not really an airport but just a merry-go-round kind of ride inside planes instead of cars. Only kids will like this! 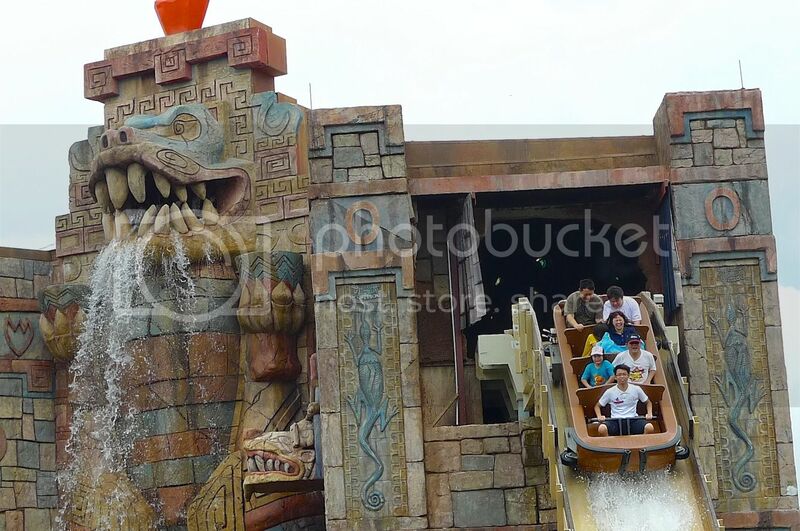 I did not take a photo of the ride inside as there were too many people blocking my view. But look! Outside the airport, I spotted these two funny looking characters. What is the man on the right holding? 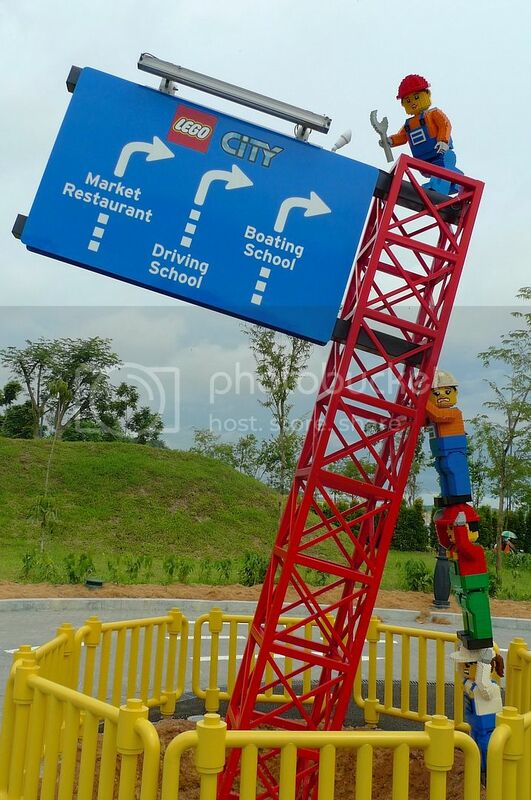 There was an acrobatic performance at the Lego City Stage that day but unfortunately, I did not take any pictures. 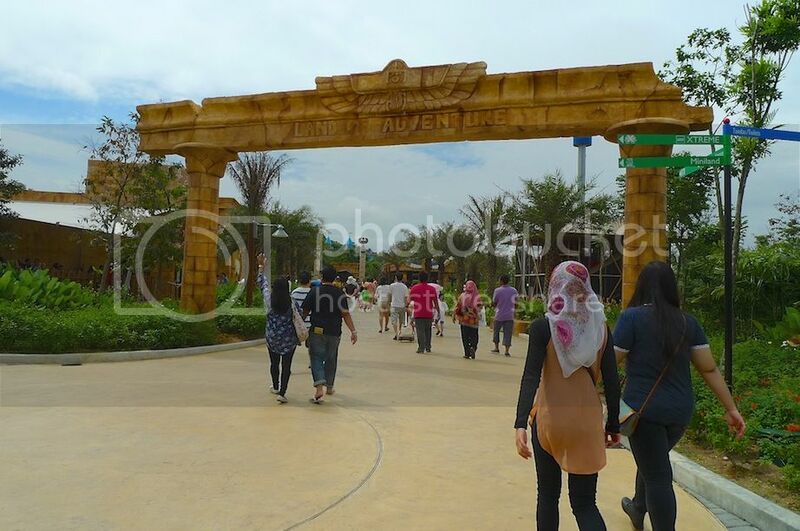 Next, I visited the Land Of Adventure. 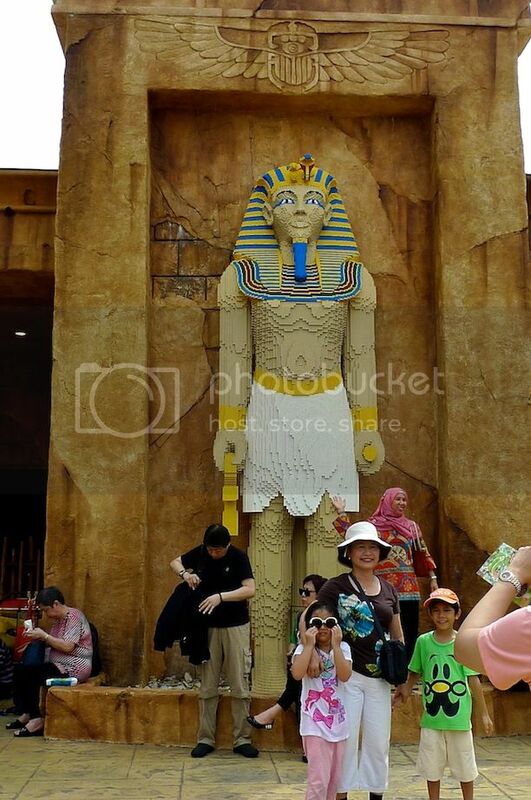 I saw a tall Egyptian Pharaoh statue in front of the Lost Kingdom Adventure. 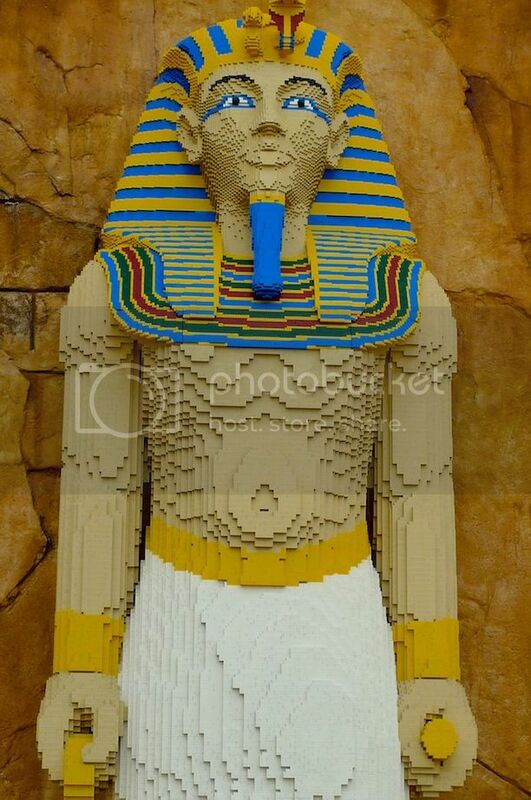 A closer shot of the Pharaoh. 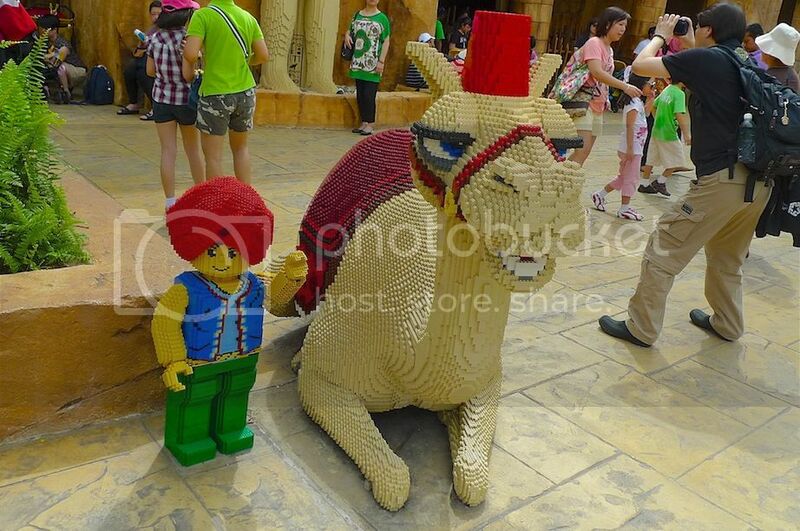 In front of the Pharaoh is this cute Lego camel with an equally cute Lego man in turban. 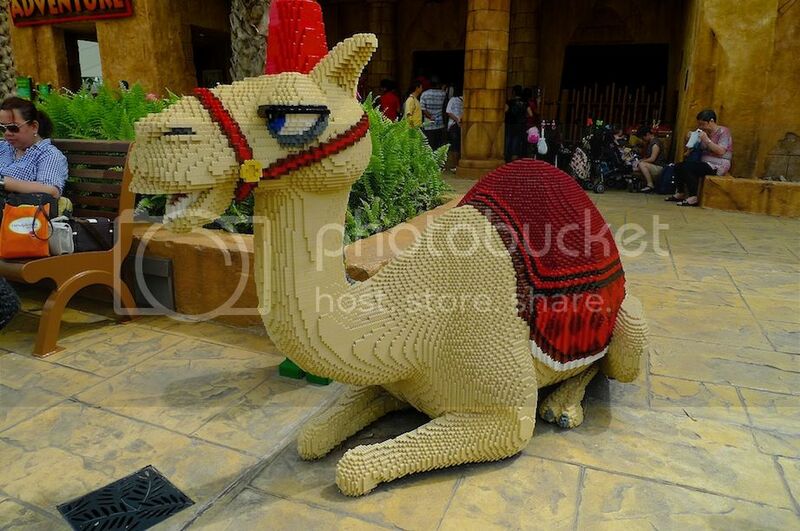 The Lego camel from a different angle. 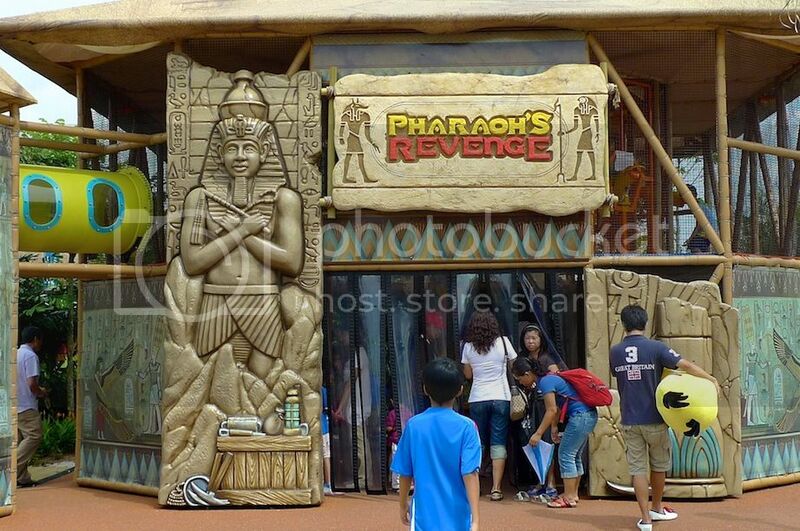 Pharaoh's Revenge. Not sure what this is as I did not enter. 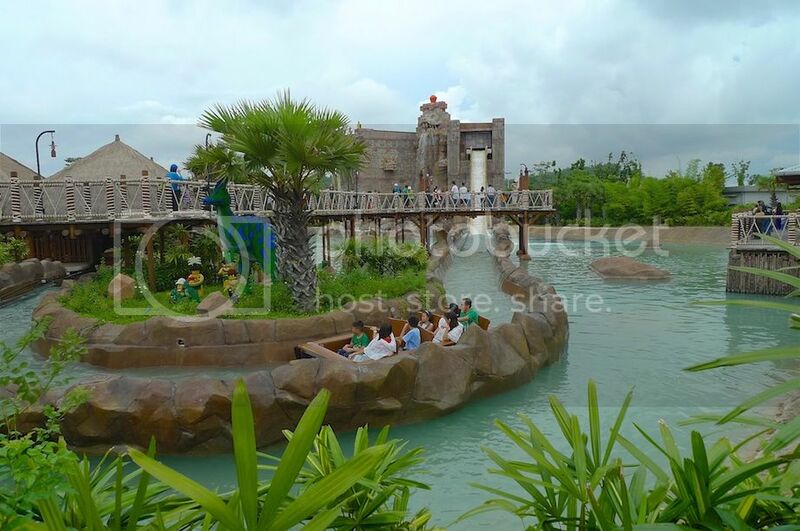 A boat ride down the river slide for the adventurers at Dino Island! I like the view here. 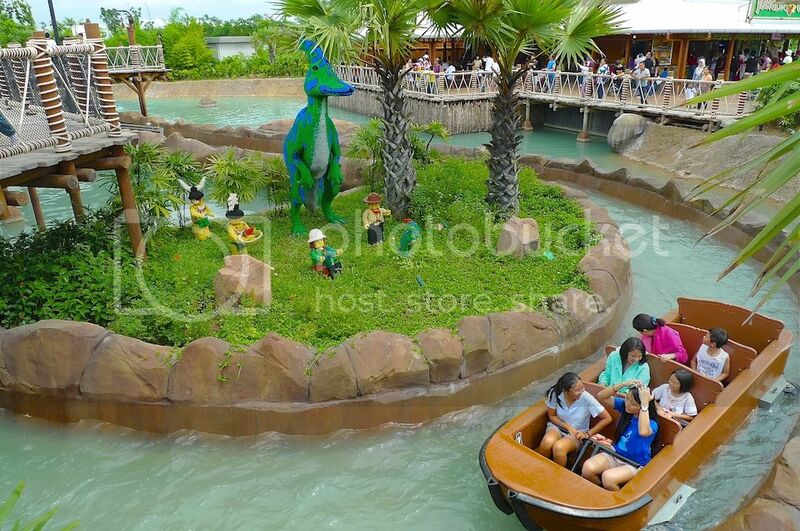 Dinosaur in the middle of an island. Boat circling round the island. 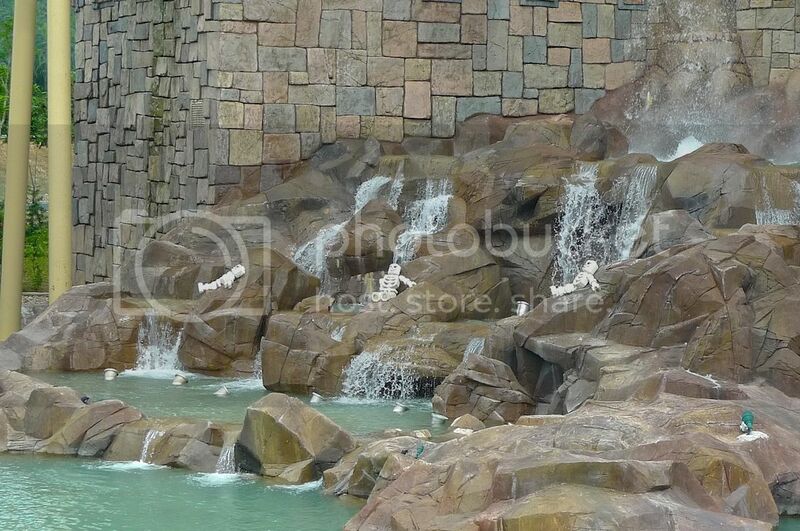 Spotted three skeletons on the rocks below the two huge dinosaurs' heads. 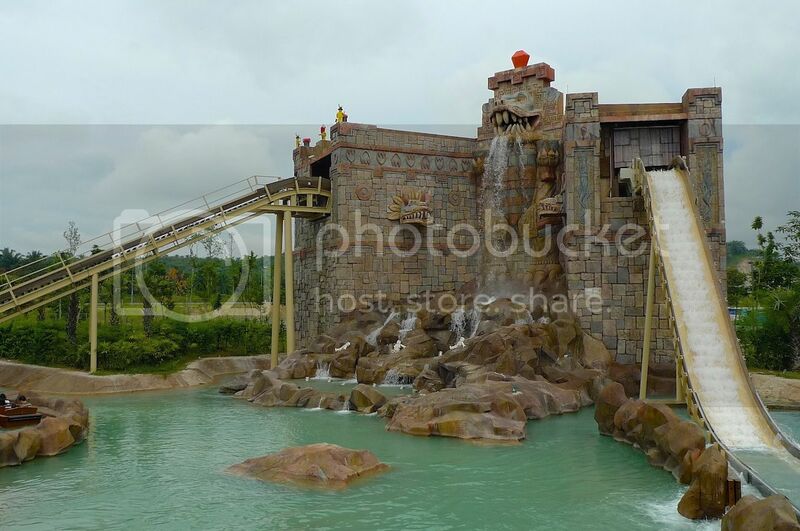 Can you see those 3 skeletons? I guess they are Lego skeletons? 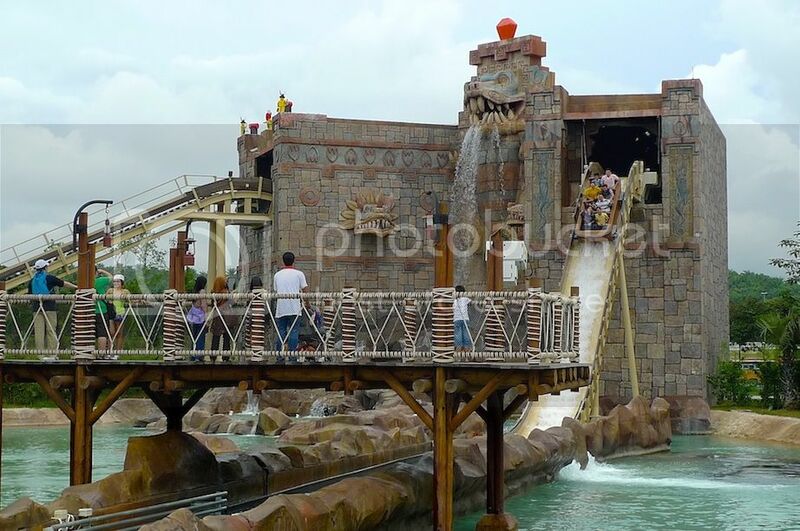 A close shot of the boat emerging from the hole and going down the stream! 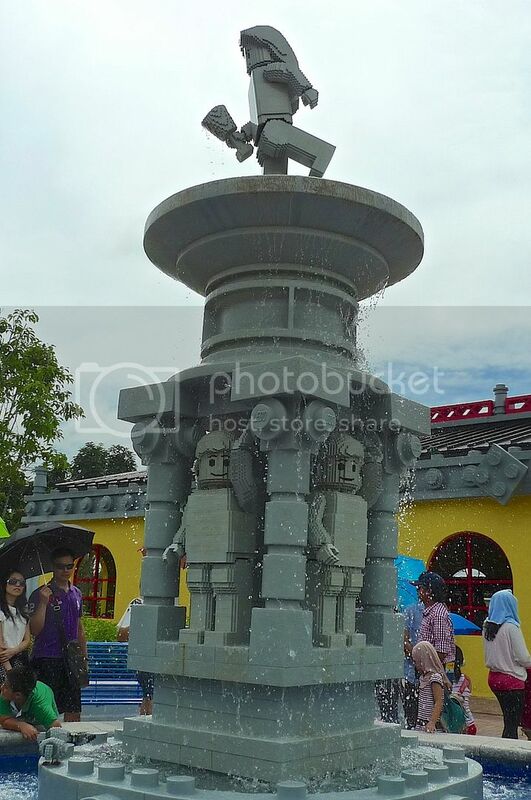 This rounds up the Land Of Adventure - one of the 7 themed areas of attractions in Legoland Malaysia.